been looking at buying one of those power packs for starting cars that comes with 120 plugs and 12 volt/usb plugs. good size battery that could be charged inside our trailer, so no off gassing. Deep cycle so can be charged over and over. Is this doable..have you seen any links.. This past winter I went on a 4 month journey along the east coast. I used a 35 ah deep cycle on the tongue and connected it to a 12 ah deep cycle in the cabin with a trolling motor quick connect . The battery on the tongue was hooked up to a battery tender for float charging as well as as a solar panel for times when electric wasnt available. I dont have a picture of the system as the trailer was recently sold but there are plenty of plans on the net for ammo box power or so called solar generators. The trolling motor caps do NOT have chargers or inverters in them. It can get pretty complex if you include all the bits and pieces eg battery plus charger (120V) or DC (either staged or unstaged charger or mppt solor/DC unit) plus inverter (1200 w) plus appropriate fuses and connections plus some sort of State of charge device/voltage output plus a box to carry it all in that is transportable. And you want it compact too. When building a TD, people often do not want all of this when they have lots of storage and less concerns about weight as it is all in the TD. Transportable is always in interesting term. The original Compaq computers were portable but at 30+ pounds, really hard to lug through an airport. That is not my unit, it is off the web. I purchased all of the components separately and built my own. It was fairly uncomplicated to do so . watch a few videos on youtube and you can get the basics. Look up DIY solar generator. I bought one of these around 10 years ago in another incarnation when I was an over the road truck driver. I still use it. I'm surprised it hasn't died yet, but I have had to fix a frayed charger wire and a broken charge port where the plastic broke away around the female connector. Nice to have around. If you build your own I hope that you will leave a follow up post to let us know how it worked out. I build these all the time and have a bunch of different versions to do different things. They are usually simply a battery of whatever size you think you need,some way to charge the battery based on your available power and some way to get power from the battery and into your devices to be powered. So if I just need to power 12vdc things I don't need to invert or make 120vac power from the battery. If I do then I need an inverter powered from the battery. 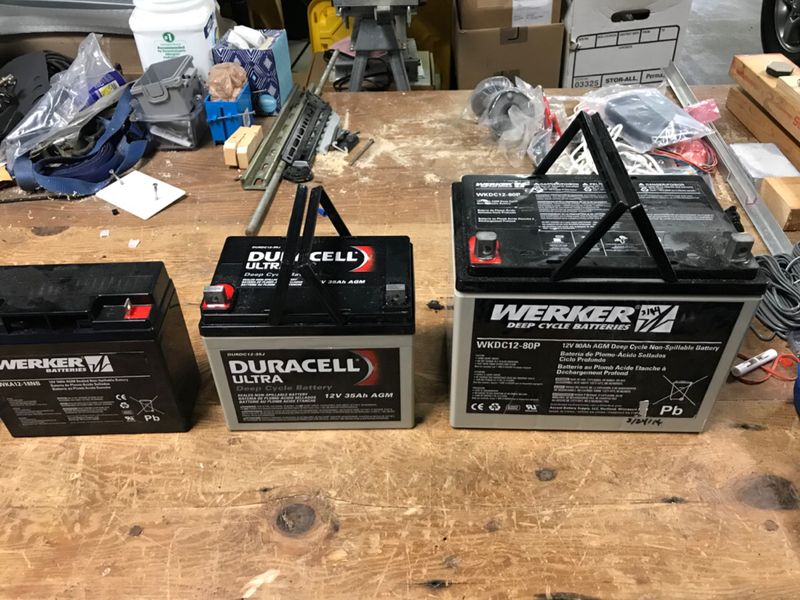 These mostly use SLA batteries which I buy Wholesale from Alarm Suppliers as I am in that business too and can get the batteries for about 1/3 the price of them at retail. I try to use better quality chargers bth for quicker charging and better treatment of the batteries but if you trickle charge them with almost any charger the batteries will be just fine too. I prefer the Xantrex chargers but have used a lot of different brands and models. 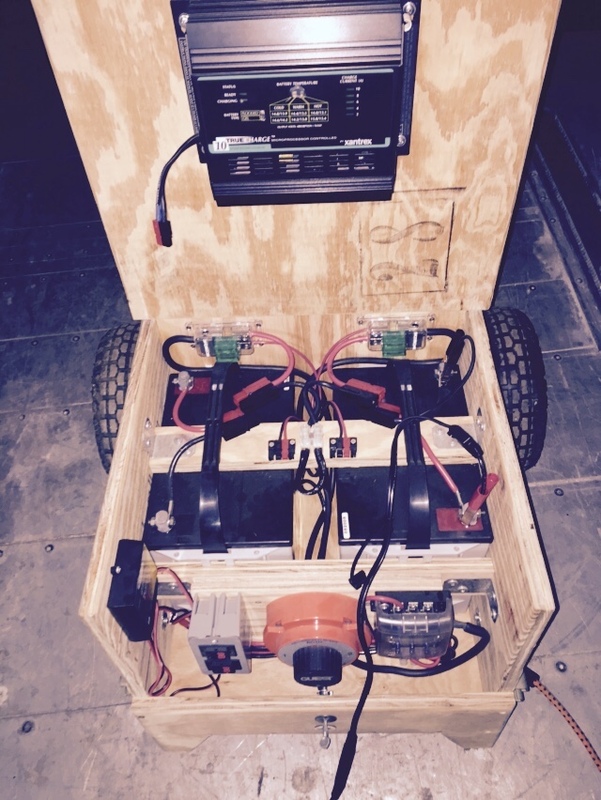 Here is a bigger one that is built onto a 2 wheel dolly that has 2-75ah batteries,a 10 amp Xantrex charger,connections to charge from Solar as an alternative including a Solar Charge Controller and an A/B/A+B/Off Switch so that I can run the outputs from either battery or both and charge one or the other or both as needed. I use this one to power Ham Radio Net Control Stations in the field and there is also a good sized table and dual antenna mounting points all built into the cart too. So nice. That would start a lot of cold, tired batteries. Well when you started this thread you rferenced the self-contained Xantrex unit and it seems to have a 51ah battery in it. I have opened a lot of units and they all seem to use what I would call SLA batteries,sealed lead acid. These days it seems that SLA and AGM are used interchangeably almost and I have decided that for my uses they are so I would use one labeled AGM or SLA. All batteries can outgas if overcharged though even the so called sealed units which still do have venting built in just for this reason. As long as you use a decent Smart Charger with a Multi-Stage Charge Program and it won't hit the battery too hard I think you will be just fine keeping these batteries inside and that is what I do in each of my trailers too. I do enclose them somehow but mainly so they don't move at all or are able to get shorted by anything falling across the terminals unless it is me working on them. I took these pics this morning to give yo an idea of the choices out there though these are not the only ones and in fact I don't have any 51ah models as are in that Xantrex box. Every portable Jump Pack that I have opened had either a 7ah or 18ah battery inside and the 2 smaller ones that I show are what these look like. The next bigger one here is a 35ah while the big boy is 80ah. I use 2 of these 80ah in my Cargo Conversion and use a 20amp Xantrex Tru-Charge Charger to keep them charged. 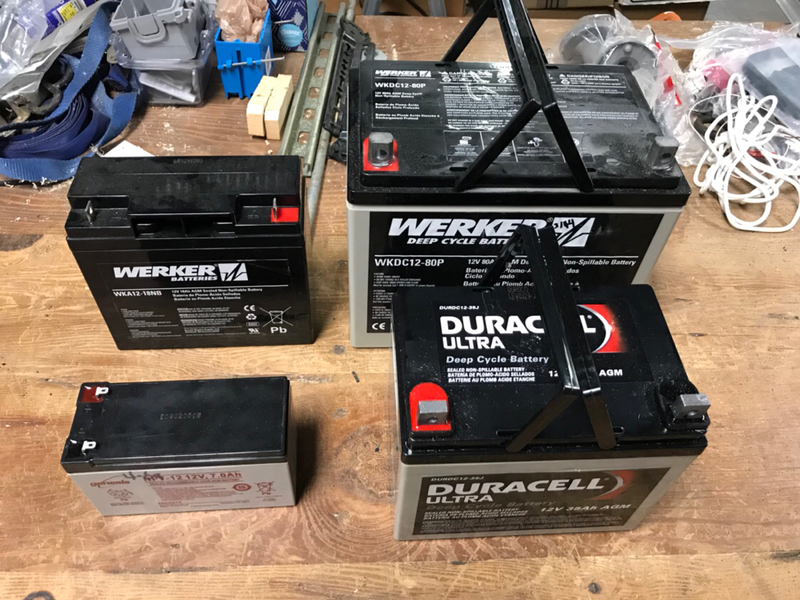 I use a lot of the 18ah batteries for portable power and I use any decent 1 or 2 amp smart charger to run them. If you go Solar you will need a Solar Charge Control to turn the Solar Panel output into a 12vdc battery charge level which most panels do not output natively though there are some that do,a controller is a good idea anyway to make sure the batteries are treated correctly for longest life and highest usability I think. 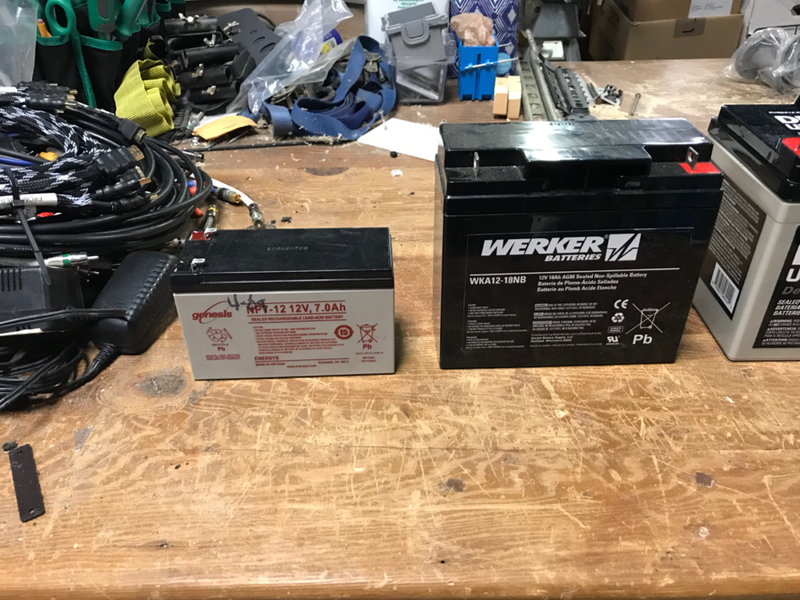 On the back end of the system if you do need to make 120vac from the 12vdc from the battery then you need to decide and calculate for yourself exactly what you think you will need and size an inverter accordingly. Regardless unless you have a whole lot of battery do not expect a lot of useful 120vac power.